The mother of a 33-year-old man fatally shot while he was driving by a Danville police officer on Nov. 3 filed a legal claim against the small East Bay town on Monday, alleging negligence and recklessness caused the wrongful death of Laudemer Arboleda. Family members released a dozen doves after a funeral service for Arboleda in Fremont on Monday. Civil rights attorney John Burris spoke with reporters after the ceremony. He pointed out photographs of Arboleda's car, showing approximately seven bullet holes in the passenger side of the windshield. Burris said that indicates the officer could have stepped out of the way. "The officer was easily in a position of safety if he wanted to be," Burris said. "He chose to shoot into that car when he could have easily avoided any type of incident." Officers attempted to pull Arboleda over shortly after 11 a.m. on Nov. 3 after receiving a call about a suspicious person, according to the Contra Costa County Sheriff's Office, which polices Danville under contract. Specifically, a caller described Arboleda walking "toward several homes with bags in his hands" and then going "back to his car," according to the Sheriff's Office. Arboleda, of Newark, twice pulled over when deputies acting as Danville police tried to pull him over, according to the Sheriff's Office. "As officers exited their cars, the suspect fled in his vehicle continuing to lead the officers in a pursuit," the Sheriff's Office said in a written statement. At Front Street and Diablo Road, Arboleda allegedly "steered his vehicle toward an officer and accelerated," the Sheriff's Office said. Burris said witnesses dispute that key part of the account. "We have a witness who said that the car was moving slowly and that he was trying to move away, and that there didn’t appear to be any reason why the police would shoot into the car," Burris said, adding that some jurisdictions, including San Francisco, prohibit officers from shooting at moving vehicles in most cases. Burris said he isn't claiming racism led to the shooting, but he described Arboleda — who was Filipino — as a brown man killed in a white neighborhood by a white police officer. "All I know is that he was a colored person, he was driving a car, and he was shot by a white police officer under circumstances that were unjustified," Burris said. The Sheriff's Office has identified Andrew Hall, a sheriff's deputy for five years, as the shooting officer. "This is a tragic case, yet once again John Burris is reaching for his well-worn race card," Sheriff David Livingston said in a written statement. "This is not about race. This is about a dangerous and reckless person trying to run down and murder a police officer." The sheriff said he looks forward to sharing more details about the case with the public. 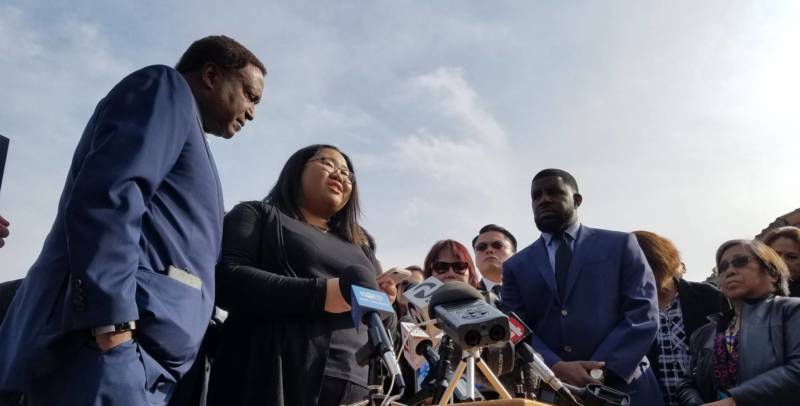 Burris and Arboleda's family decried the sheriff's decision to withhold video of the shooting until a coroner's inquest, which is expected in several months. "We have not received any information from authorities as to what actually took place on that day," said Arboleda's niece, Jessica Leong. "As much as we would like to have justice for my uncle, we also want to know what really took place on that day, and why Danville police took the actions that they did." Family members said Arboleda had struggled with mental illness in the past year, but declined to go into further detail. "My son is a good person," said Arboleda's mother, Jeannie Atienza. "He doesn’t have any criminal record at all, and he is a good son. I want justice for my son. ... I will fight, we will fight for him."